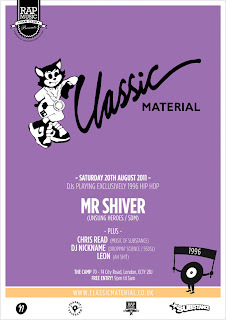 DJs MR SHIVER (Unsung Heroes/SDM), CHRIS READ (Music of Substance/BBE), NICKNAME (Droppin Science) and LEON (Ah Sh!t) will be playing nothing but 1996 hip hop all night long at CLASSIC MATERIAL tonight at the CITY & ARTS MUSICAL PROJECT in London. Nearest tube is OLD STREET and entry if free as always. The CLASSIC MATERIAL nights are the ultimate if you wanna reminisce musically about the boom bap sound of the mid 90s, and don't forget to visit the CLASSIC MATERIAL online shop to pick up year-related box sets, tee shirts, and copies of the legendary CLASSIC MATERIAL mixes put together by CHRIS READ.